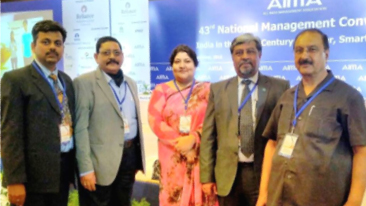 AIMA organiz ed 43rd National Management Convention (NMC) with the theme on “India in the Asian Century – Cleaner, Smarter, Faster”, which was held at Hotel Le- Meridian during 21-22 September 2016. Dr. Aneet, President, Mr. Deepak K Dhingra, Secretary General, Dr. S K Sharma, Joint Secretary, Mr. Ashok Verma, EC member and Mr. Lalit Bajaj, Special Invitee attended the convention. AIMA also convened its 58th Annual General Meeting on 21st September under the chairmanship of President (designate) Mr. S K Munjal. The two days long NMC went-off in shining colours with a lot of learning from the deliberations.